I’ve had Saturday, April 2nd circled on my calendar for quite some time. I love exploring the Pacific Coast and low tides provide a window of opportunity to explore some of the gems of the Pacific coastline that are only accessible during low tide. The NOAA Tide Predictions forecasted a 0.8 low tide for La Push at 3:26 PM last Saturday (April 2nd). With the return of warmer Spring weather and the ideal mid-afternoon timing, I realized I was in for a special Saturday excursion to La Push. I made the 1 hour 30 minute drive from Port Angeles to Rialto Beach and arrived shortly after 2:30 PM. Low tides provide the only opportunity to safely hike to Hole in the Wall at Rialto Beach, thus I made a 2 mile bee line in order to have ample time to explore, arriving around 3:00 PM. I spent the next hour and a half walking side-by-side amongst the enormous sea stacks surrounding the hole in the wall and photographing this remarkable venue. For those not prone to a fear of heights, there is a trail marker adjacent to the Hole in the Wall, which allows you to climb to an incredible vantage point showcasing the entire coastline of Rialto Beach. Thanks to Daylight Savings Time, sunset wasn’t until 7:49 PM that evening, so I was able to take a break in the action and enjoy dinner at River’s Edge Restaurant. It is located right alongside the Quillayute River and provides a beautiful front-row seat to La Push’s sea stacks. This was the perfect way to recharge the batteries after the 4 mile jaunt to Hole in the Wall, but still savor that Pacific Coast experience. A sunset at Second Beach should be on everyone’s bucket list for 2016. The evening sunlight simply brings out the best of this venue. Second Beach provides some of the most breathtaking views I’ve ever seen. An endless sandy coastline, massive sea stacks that seem out of this world, and of course, there’s nothing like hearing Pacific Ocean crash into the shoreline. A quick, enjoyable 0.7 mile hike through the Olympic National Park forest leads you to the coast. Once you arrive, you’ll surely be in awe. As always, photographers line up in front of the sea stacks to capture their own postcard image of the iconic Second Beach sunset. Be sure to bring a headlamp if you plan on watching the sunset for the return hike back into the forest. There is a 1.0 low tide on April 16th at 3:45 PM in La Push. 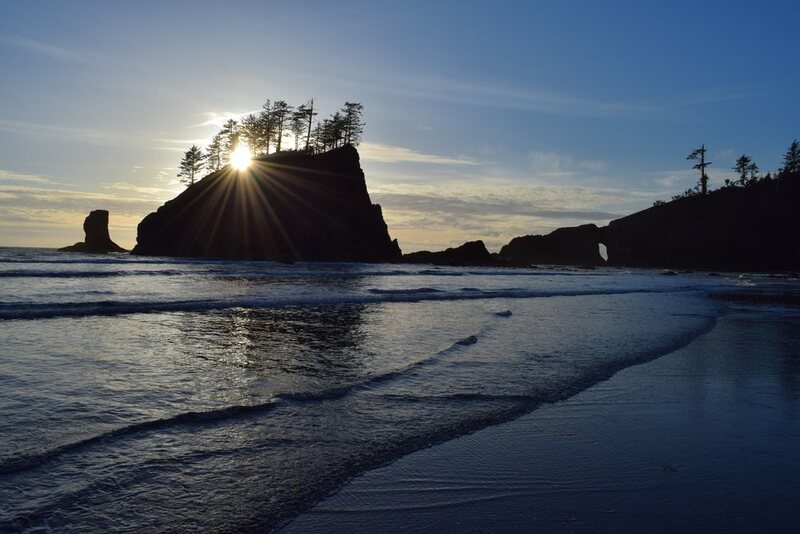 Perhaps you want to embark on your own La Push adventure. Contact me at discover@peninsulatrips.com or (360) 457-2259 if you want help planning this trip or any other Olympic Peninsula explorations.